Solid hi-tech style motorcycle gloves, constructed with fine graded Drum Dyed Nacked Cow Hide supported by superior type of Hard Carbon Kevlar protection at backhand and fingers. Gloves is lined with Kevlar® + Nomex® (fire + scratch resistant fabric) and stitched with Kevlar Thread to enhance durability and ensure safety when skidded at higher speed. 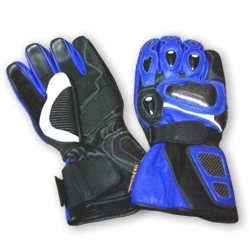 Our gloves provide perfect safety to one & off road motorcycle racers. This glove comes in two versions (for summer + for Winter). o Molded Hard Carbon Kevlar Protection. o Available in without Kevlar® Thread Stitching. o Re-Enforcement at palm to give more protection.